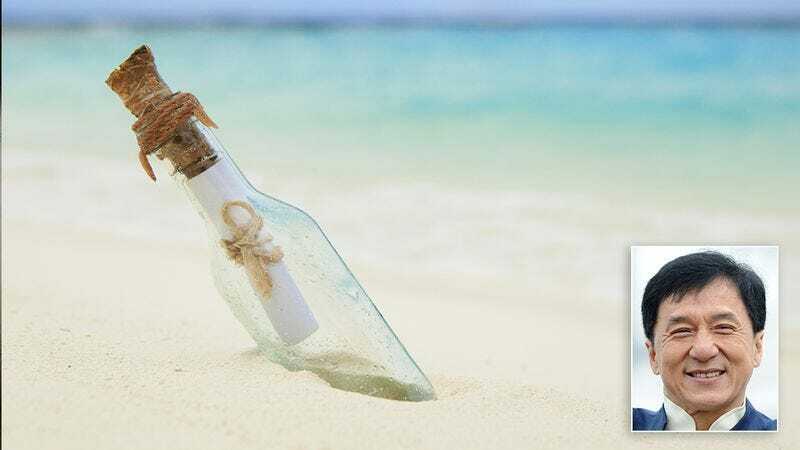 I can’t go to the beach without finding these messages in bottles from a marooned Jackie Chan. 1. This one was bobbing around the tidal shallows. It was the first bottle I found, so I didn’t know who could have written it. 2. This one washed up right onto my feet while I was wading in the surf. 3. Found this one under a really big conch. 4. Here’s a bottle that was buried real deep in the sand. Good thing I had my beach shovel with me, which I mostly use to dig up shells and driftwood. 5. Found this bottle while fishing. I got real excited that I had caught a big one, but it was just another bottle from Jackie Chan. 6. I think Jackie Chan was getting a little frustrated here, and I can’t say that I blame him. 7. I’m just glad that things worked out for the best.